For more: Zimbio gallery, Express article. 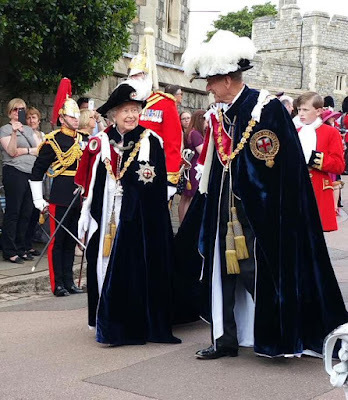 After a busy morning getting her Magna Carta party on (ain't no party like a Magna Carta party, people), Her Maj got all fancied up in her feathery best for the annual service of the Order of the Garter. By my own flashback count, Queen Victoria's big pearl earrings haven't been worn for Garter Day since 2000, so that's a welcome return (even though I can't help but hope for some colored stones every year, since we already get plenty of white stones at every other event). Usually there is a bracelet for us to drool over too, but I can't spot any this year. She's wearing a triple strand of pearls that belonged to Queen Elizabeth The Queen Mother, and unfortunately here we can't see that it has a clasp containing a rather large diamond (something for us to cover in the future!). The rest of her jewels are all part of her daily uniform, including her Everyday Pearl Pendant Earrings and her Everyday Bracelets. Tune in to the other blog tomorrow for more on the Order of the Garter Service, including more family members!